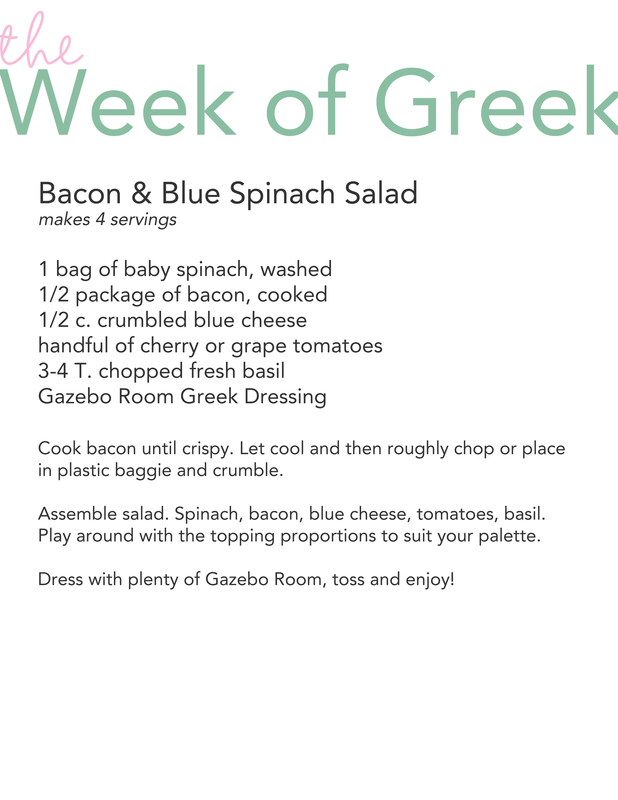 Week Of Greek: Spinach Salad - life. photos. scrapbooking. I wanted to share with you one last salad recipe that Clark and I eat year round with some frequency. The ingredients in this spinach salad are a great combination of bold specific flavors that we've grown to love. First - cook up your bacon. Next, assemble your salad: Spinach first. ** Eat some hummus and Tostitos while you work. Then toss on some crumbled Blue Cheese. And have your sous chef put the cooked bacon in a ziploc baggie and crush it up.... like so. Or - you can give it a rough chop... but again, I'm all about no clean up. Who wants to wash a knife and a cutting board if you don't have to? Throw in some tomatoes. I used half a container of grape tomatoes. Since Clark doesn't like them - they are the easiest variety to pick out. Finally, chop up your basil. This is my favorite technique. Wash and dry some fresh basil leaves... stack them up and use your kitchen shears to shred them thinly into the salad. Lastly - the woo-woo juice. The thing that make's all good things better... the reason for this week of devotionals.... the illustrious Gazebo Room Greek Dressing. Give it all a toss and serve it up! bacon, blue cheese, gazebo room? how could you not love a little spinach??? this has been such a yummy, informative week on something that i LOVE! all the recipes will certainly get tried, used and enjoyed...thanks for sharing the recipes and secret miracle dressing! Clark needs to give in to the tomatoes!